"Sabtah" redirects here. For the Biblical figure, see List of minor Biblical figures. For other uses, see Ceuta (disambiguation). Ceuta (Spanish pronunciation: [ˈθeuta]) is an 18.5-square-kilometre (7.1 sq mi) autonomous city of Spain and an exclave located on the north coast of North Africa surrounded by Morocco. Separated from the Iberian peninsula by the Strait of Gibraltar, Ceuta lies on the border of the Mediterranean Sea and the Atlantic Ocean. Ceuta along with the other Spanish exclave Melilla are the only Spanish territories located in mainland Africa. It was regarded as a part of Cadiz province prior to 14 March 1995, when the city's Statute of Autonomy was passed. Ceuta (like Melilla) was a free port before Spain joined the European Union. As of 2008, it has a population of 75,276. Its population consists of Christians, Muslims (chiefly Moroccan Arabic speakers), and small minorities of Jews and Hindus. Spanish is the official language. Morocco had previously called for negotiations on the future of Ceuta, Melilla and a number of Mediterranean islands and enclaves which border it. The majority of the city's population are ethnic Spanish who are opposed to the idea of being ruled by Morocco. A poll conducted by Instituto Opina found that 87.9% of people from mainland Spain consider the two cities to be Spanish. Ceuta's location has made it an important commercial trade and military way-point for many cultures, beginning with the Carthaginians in the 5th century BC, who called the city Abyla. It was not until the Romans took control of the region in AD 42 that the port city, then named Septa, assumed an almost exclusive military purpose. It changed hands again approximately 400 years later, when Vandal tribes ousted the Romans. It then fell into the hands of the Visigoths, and finally become an outpost of the Byzantine Empire. Around 710, as Muslim armies approached the city, its Byzantine governor, Julian (described as King of the Ghomara) changed his allegiance, and exhorted the Muslims to invade the Iberian Peninsula. Under the leadership of Berber General Tariq ibn Ziyad, the Muslims used Ceuta as a staging ground for an assault on Visigothic Iberian Peninsula. After Julian's death, the Arabs took direct control of the city, something that the indigenous Berber tribes resented. They destroyed Ceuta during the Kharijite rebellion led by Maysara al-Matghari in 740. Ceuta lay in ruins until it was resettled in the 9th century by Mâjakas, chief of the Majkasa Berber tribe, who started the short-lived Banu Isam dynasty. His great-grandson would briefly ally his tribe with the Idrisids, but the Banu Isam rule ended in 931 when he abdicated in favor of the Umayyad Caliph of Cordoba, Abd ar-Rahman III. Ceuta reverted to Moorish Andalusian rule in 927, along with Melilla, and later Tangier, in 951. Chaos ensued with the fall of the Umayyad caliphate in 1031, but eventually Ceuta and the rest of Muslim Spain fell into the hands of successive North African dynasties. Starting in 1084, the Almoravid Berbers ruled the region until 1147, when the Almohads who conquered the land and ruled, apart from Ibn Hud's rebellion of 1232, until the Tunisian Hafsids established their control. The Hafsids' influence in the west rapidly waned, and Ceuta's inhabitants eventually expelled them in 1249. After this, a period of political instability persisted, under competing interests from the Kingdom of Fez and the Kingdom of Granada. The Kingdom of Fez finally conquered the region in 1387, with assistance from the Crown of Aragon. In 1415, during the Battle of Ceuta, the city was captured by the Portuguese during the reign of John I of Portugal. The King of Spain, Phillip II, seized the Portuguese throne in 1580 and held it for 60 years (Iberian Union). During this time Ceuta gained many residents of Spanish origin. Thus Ceuta became the only city of the Portuguese Empire that sided with Spain when Portugal regained its independence in 1640 and war broke out between the two countries. The formal allegiance of Ceuta to Spain was recognized by the Treaty of Lisbon by which, on January 1, 1668, King Afonso VI of Portugal formally ceded Ceuta to Carlos II of Spain. However, the originally Portuguese flag and coat of arms of Ceuta remained unchanged and the modern-day Ceuta flag features the configuration of the Portuguese shield. The flag's background is also the same as that of the flag of Lisbon. When Spain recognized the independence of Spanish Morocco in 1956, Ceuta and the other plazas de soberanía remained under Spanish rule as they were considered integral parts of the Spanish state - which Morocco strongly disputed. Culturally, modern Ceuta is part of the Spanish region of Andalusia. Indeed, it was attached to the province of Cádiz until 1925 — the Spanish coast being only 20 km away. It is a cosmopolitan city, with a large ethnic Berber Muslim minority as well as Sephardic Jewish and Hindu minorities. On November 5, 2007, King Juan Carlos I visited the city, sparking great enthusiasm from the local population and protests from the Moroccan government. It was the first time a Spanish head of state had visited Ceuta in 80 years. Ceuta (and Melilla) have declared the Muslim holiday of Eid al-Adha or Feast of the Sacrifice, as an official public holiday from 2010 onwards. It is the first time a non-Christian religious festival is officially celebrated in Spain since the Reconquista. The Catholic Diocese of Ceuta existed from 1417 to 1879. It was a suffragan of the Patriarchate of Lisbon until 1675, with the end of the Iberian Union, when Ceuta chose to remain linked to the king of Spain. Since then it was a suffragan of the archbishopric of Seville. The Diocese of Tanger was suppressed and incorporated to that of Ceuta in 1570. In 1851, upon the signature of the concordat between the Holy See and Spain, the diocese of Ceuta was agreed to be suppressed, being combined into the diocese of Cádiz y Ceuta (up to then diocese of Cádiz y Algeciras), whose bishop usually was the apostolic administrator of Ceuta. The agreement was not implemented until 1879. Ceuta is dominated by Monte Anyera, a hill along its western frontier with Morocco. The mountain is guarded by a Spanish fort. Monte Hacho on the Peninsula de Almina overlooking the port is one of the possible locations for the southern Pillars of Hercules, of Greek legend (the other possibility being Jebel Musa). Ceuta is known officially in Spanish as Ciudad Autónoma de Ceuta (English: Autonomous City of Ceuta), with a rank between a standard Spanish city and an autonomous community. Ceuta is part of the territory of the European Union. The city was a free port before Spain joined the European Union in 1986. Now it has a low-tax system within the European Monetary System. As of 2006, its population was 75,861. 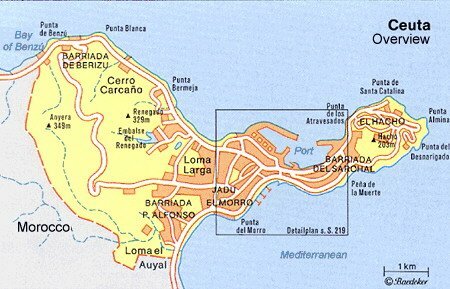 Ceuta is subdivided into 63 barriadas (English: neighborhoods), such as Barriada de Berizu, Barriada de P. Alfonso, Barriada del Sarchal, and El Hacho. Since 1995, Ceuta is, along with Melilla, one of the two autonomous cities of Spain. The government of Morocco has repeatedly called for Spain to transfer the sovereignty of Ceuta and Melilla, along with uninhabited islets such as the islands of Alhucemas, Velez and the Perejil island, drawing comparisons with Spain's territorial claim to Gibraltar. In both cases, the national governments and local populations of the disputed territories reject these claims by a large majority. The Spanish position states that both Ceuta and Melilla are integral parts of the Spanish state, and have been since the 16th century, centuries prior to Morocco's independence from France in 1956, whereas Gibraltar, being a British Overseas Territory, is not and never has been part of the United Kingdom. Furthermore, Ceuta has been under Christian rule (Spanish or Portuguese) for a longer period than major cities in peninsular Spain such as Málaga, Granada or Almería, and has been so since before the creation of the Spanish state in 1475. Morocco denies these claims and maintains that the Spanish presence in Ceuta and the other presidios on its coast is a remnant of the colonial past which should be ended. However, the United Nations list of Non-Self-Governing Territories do not consider those Spanish territories to be colonies, whereas it does declare Gibraltar as a non-decolonized territory. A sign welcoming visitors to Ceuta, showing the flags of Ceuta, Spain and the European Union. The official currency of Ceuta is the euro. It is part of a special low tax zone in Spain. Ceuta is one of two Spanish port cities on the northern shore of Africa, along with Melilla. They are historically military strongholds, free ports, oil ports, and also fishing and smuggling centers. Today the economy of the city depends heavily on its port (now in expansion) and its industrial and retail centres. Ceuta Heliport is now used to connect the city to mainland Spain by air. Along with Melilla, Ceuta is the main link to and from the plazas de soberanía, especially the Islas Chafarinas, occupied by Spain during the 19th century. The city receives high numbers of ferries each day, most from Spain. Occasionally, cruise ships stop by. Most all dock within an easy walk of downtown shops and restaurants. Ceuta is a smaller city than others in Spain. There is a bus service throughout the city which does not pass into neighbouring Morocco. Ceuta has a regular helicopter service from Ceuta Heliport to mainland Spain. Ferries cross from Algeciras in Andalucia in the south of Spain. ^ "Spain's North African enclaves: Gibraltar in reverse?". The Economist. http://www.economist.com/node/999729. Retrieved 2011-09-03. ^ "Spaniards Review Ceuta and Melilla Situation | Angus Reid Public Opinion". Angus-reid.com. 2007-11-06. http://www.angus-reid.com/polls/29196/spaniards_review_ceuta_and_melilla_situation/. Retrieved 2011-09-03. ^ Griffin, H (2010). Ceuta Mini Guide. Mirage. ISBN 978-0-9543335-3-9. http://www.miragebooks.co.uk/ceuta. ^ "Resistir en el monte del Renegado · ELPAÍS.com". Elpais.com. 2009-03-22. http://www.elpais.com/articulo/espana/Resistir/monte/Renegado/elpepuesp/20090322elpepinac_9/Tes. Retrieved 2009-06-17. ^ "Ceuta y Melilla son España, dice Juan Carlos I; Sebta y Melilia son nuestras, responde Mohamed VI". Blogs.periodistadigital.com. 1999-02-22. http://blogs.periodistadigital.com/infordeus.php/2007/11/06/p125486. Retrieved 2009-06-17. ^ "Muslim Holiday in Ceuta and Melilla". Spainforvisitors.com. http://spainforvisitors.com/module-News-display-sid-310.htm. Retrieved 2011-09-03. ^ "Public Holidays and Bank Holidays for Spain". Qppstudio.net. http://www.qppstudio.net/bankholidays2010/spain.htm. Retrieved 2011-09-03. ^ David M. Cheney. "''Catholic Hierarchy'' page". Catholic-hierarchy.org. http://www.catholic-hierarchy.org/diocese/dc206.html. Retrieved 2010-08-08. ^ "Catholic Encyclopedia: Tingis". Newadvent.org. 1912-07-01. http://www.newadvent.org/cathen/14736a.htm. Retrieved 2010-08-08. ^ "Catholic Encyclopedia: Cadiz". Newadvent.org. 1908-11-01. http://www.newadvent.org/cathen/03131b.htm. Retrieved 2010-08-08. ^ "Weatherbase: Historical Weather for Ceuta". http://www.weatherbase.com/weather/weatherall.php3?s=2306&refer=&units=metric. ^ "Códigos postales de Ceuta en Ceuta". Codigo-postal.info. http://codigo-postal.info/ceuta/ceuta?page=7. Retrieved 2009-06-17. ^ "Ley Orgánica 1/1995, de 13 de marzo, Estatuto de Autonomía de Ceuta". Noticias.juridicas.com. http://noticias.juridicas.com/base_datos/Admin/lo1-1995.html. Retrieved 2009-06-17. ^ Tremlett, Giles (2003-06-12). "A rocky relationship | World news | guardian.co.uk". London: Guardian. http://www.guardian.co.uk/world/2003/jun/12/worlddispatch.gibraltar. Retrieved 2009-06-17. ^ "Economic Data of Ceuta, de ceutna digital". Ceuta.es. http://www.ceuta.es/servlet/ContentServer?idioma=es_es&mD=true&pagename=CeutaTur%2FInformacionViajero%2FInformacionViajeroDetalle&cid=1113994915129&mC=true&idP=1111055969345&idA=1113994915129. Retrieved 2009-06-17. ^ pp. 6–7, IBRU, Boundary and Territory Briefing. Ceuta and the Spanish Sovereign Territories: Spanish and Moroccan. http://books.google.com/books?id=xuBgaSzsYVgC&printsec=frontcover&dq=ceuta+economy&cad=0#PPA7,M1. Retrieved 2009-06-17. ^ "Economic Data of Ceunta, de ceutna digital". Ceuta.es. http://www.ceuta.es/servlet/ContentServer?idioma=es_es&mD=true&pagename=CeutaTur%2FInformacionViajero%2FInformacionViajeroDetalle&cid=1113994915129&mC=true&idP=1111055969345&idA=1113994915129. Retrieved 2009-06-17. ^ "Ceuta travel guide". Wikitravel. 2010-03-06. http://wikitravel.org/en/Ceuta#Get_around. Retrieved 2010-08-08. This article incorporates text from a publication now in the public domain: Herbermann, Charles, ed (1913). "Diocese of Cadiz". Catholic Encyclopedia. Robert Appleton Company.